Map Description This is my second completed map level. 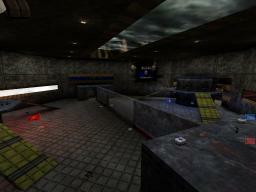 This is a small intense CTF map with nice detail and a Radiation hazard theme. This map is good for 2on2 or 3on3 CTF fast paced action. Full bot support. Enjoy. So please check my map out. Let me know what you think. yay u better get get you skybox straightened out dude! EDIT: You'll have to ask a_z what's wrong, I don't know... looks fine to me..."dude"
umm, well what exactly is wrong with the skybox so I can fix it??? By "screwed," I think he means that it looks unconvincing. The sky should appear as though it reaches all the way to the horizon on all sides, whereas in your skybox it's clearly just a square floating above the mountains, which is decidedly odd. And there's a second sky below the player's point of view, which is even stranger. The clouds pan far too quickly to be believable; something like one-tenth their current speed would be better. The mountain textures are used incorrectly -- there are four of them meant to be used together so the whole range connects seamlessly, whereas you've only used one that's tiled over and over and misaligned at the corners. 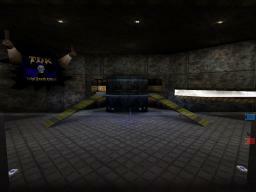 And even if they had been used correctly, the textures look rather out of place amongst your otherwise urban theme. Some other things: you haven't used the grid properly, or trimmed most surfaces that need it, or attempted to align your textures. You have pickups that are embedded in the ground (the Body Armors, most noticeably). Several of your PlayerStarts spawn players facing right up against a wall, which is extremely annoying. Your AlternatePath actors aren't used correctly; they're all assigned to the same team. Basically, the entire thing comes across very much as a work in progress, rather than a completed map. It lacks polish. The layout is boring too, but really, you should work on correcting all these technical faults before you attempt anything more complicated. Your brushwork in particular will land you in a hell of unintended surfaces and BSP holes if you don't improve it. This is StarFire's second map. And i think she's done a great job on it. I've played it and it is fun to play. OK the skybox is a bit wierd and the grid could have been used to align the level better but it's not something that will make the map realy crappy now...is it.